According to the findings by the World Health Organization, the cost accompanying medical errors amounts to $42 billion annually or almost 1% of total global health expenditure. It causes a minimum of one death every day and injures approximately 1.3 million people annually in the United States of America. As a consequence, the flourishing healthcare sector is enhancing the approaches of its operations with the help of emerging robotics and automation techniques, commonly known as medical robots. 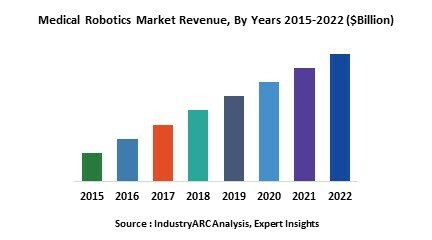 With increasing instances of intricate medical conditions such as cancer, cardiovascular disease, gynecological diseases, urological disorders, and orthopedic conditions followed by surgeries, the global medical robotics market is poised for exponential growth. As per the Texas Heart Institute, just the number of heart transplants each year exceeds 3,200 in the United States alone. As a result of the healthcare sector, proceeding towards innovation and precision, the medical robotics market size is estimated to be around $5,250 million to $6,200 million as of 2018. With the influx of governmental funds for R&D and accepted integration of medical science with robotic technology, this sector is progressing with a global compound annual growth rate (CAGR) of 11.5% - 12.5% during the forecast period of 2019-2025. Since the medical robotics market is not just limited to surgical robots, other examples of predominant medical robotic innovations are rehabilitation robots, biorobots, and telepresence robots. Employment of these by the healthcare sector is extremely benefitting to reduce the work-stress of medical staff and consequence major operational and economic efficiencies for the healthcare facilities. According to a report by the International Federation of Robotics, medical robot sales increased by a huge figure of 73% in 2017 over the preceding year. After an acute analysis of the medical robotics regional markets, Americas is reckoned to be the leading employer of medical robotics. This region constituting developed and advanced settlements such as The United States and Canada is accountable for an enormous 50%-60% of the global medical robotics market. Such estimations can be stimulated towards confirmation by A Retrospective Study of 14 Years of FDA Data, which concludes that between 2007 and 2013, over 1.74 million robotic procedures were performed in the U.S. The increasing demand for minimal and non-invasive surgery is a major trend disrupting the Non-invasive radiosurgery robots market demand. Medical robotic systems have been widely employed for minimally invasive surgeries in the field of gynecology, cosmetology, open surgery, laparoscopic procedures, and flexible endoscopic procedures. These procedures offers negligible complications, diminish the threat of infections, reduces pain, and have quicker recovery period leading towards shorter hospital stay usually contradicted with outdated treatments. Minimal Invasive Surgery is dominating the market and is estimated to reach $259.6 million by 2023. Exoskeletons, the new trend helps patients in many ways such as in helping paralyzed people to walk, rehabilitation of stroke or spinal cord injury patients. They can also enhance strength in order to allow a nurse to lift an elderly patient. VEBOT a blood drawing robot, it helps to speed up the procedure than the regular method which is carried out with a needle. The whole process takes just about a minute. U.K. scientists has introduced the world’s smallest surgical robots called “Versius” used to carry out many laparoscopic procedures which include ear, nose, prostate and throat surgery, colorectal operations and hernia repairs. Companion robots can serve as a social partner for their patients and also help them improving in their health conditions to alleviate loneliness or treat mental health issues. Some the examples of companion robots include Buddy, Pepper, Jibo, and Paro. High-cost tailgating medical robotics operations and lack of skilled professionals in developing countries are major factors restraining the market. However, with proper funding and patenting, such innovations can be commercialized for serving the masses. Some of the key players and innovators associated with the medical robotics market are Intuitive Surgical Inc., Accuray Inc., Stryker Corporation, Hacoma AG. Major Robotics Ltd, Titan Medical Inc., Hansen Medical Inc., MedtEch S.A., Kuka Roboter GMBH, and Irobot Corporation. Intuitive Surgical Inc. is, is an American corporation that develops, manufactures and markets robotic products designed to improve clinical outcomes of patients through minimally invasive surgery. It can be asserted as the pioneer of medical robotics since its manufactured, ‘The da Vinci surgical system’ was one of the first robotic-assisted, minimally invasive surgical systems cleared by the FDA. Today, da Vinci systems and technologies is used by surgeons in all 50 U.S. states and 66 countries around the world. The base year of the study is 2019, with forecast done up to 2025. The study presents a thorough analysis of the competitive landscape, taking into account the market shares of the leading companies. It also provides information on unit shipments. These provide the key market participants with the necessary business intelligence and help them understand the future of the Medical Robotics Market. The assessment includes the forecast, an overview of the competitive structure, the market shares of the competitors, as well as the market trends, market demands, market drivers, market challenges, and product analysis. The market drivers and restraints have been assessed to fathom their impact over the forecast period. This report further identifies the key opportunities for growth while also detailing the key challenges and possible threats. The key areas of focus include the various applications in Chromium Market and their specific segmented revenue. 1. Is the market for the Medical Robotics growing? How long will it continue to grow and at what rate? 13. What is our Vision 2030 for Medical Robotics market?